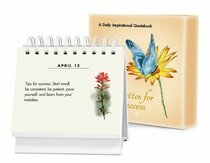 :The Mottos for Success series of inspirational quotebooks offer an original maxim for each day of the year. This second edition in the series contains ideas, tips, and counsel to reflect on and implement. A perpetual desktop quotebook/calendar. About "Mottos For Success (Vol. 2)"
Jessie Richards grew up across 10 countries in Europe, South America, and Asia, where her parents were teachers and social workers. She has compiled, edited, or authored a variety of spiritual and personal growth-themed publications and articles during her career as a writer, editor, and project manager for various publishing houses as well as nonprofit organizations. She now resides in New York City, and some of her favorite things to do are read old classics and go for long walks.